Quilting Adventures: Spent the afternoon in the kitchen ... groovin' and cookin' ... ! Spent the afternoon in the kitchen ... groovin' and cookin' ... ! It was one of those days where I wanted to make something in the kitchen. Soup would be good given that it is snowing this afternoon. 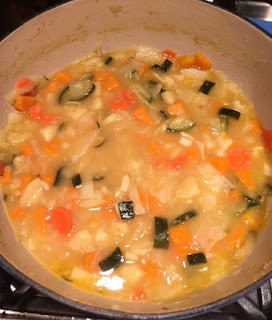 I decided to cook up a recipe I have been meaning to try from the Kripula center called Harvest Stew. After my morning ritual at our local coffee shop, I went grocery shopping for ingredients. Came home, put on some music ... Mellow Maurice play list in honor of my late Uncle Maurice ... and began prepping. Gosh it smells soooo good! See, look how much is gone already! I am not kidding you, what a great tasting vegetable soup. Okay, it wasn't all me, I did bring a large canning jar to a friend of mind who is battling influenza. I just had to include it in her care package! In a large Dutch oven, heat the butter and begin sautéing the onions. When the onions start to sweat, add a pinch of sea salt and add the carrots. Add each additional vegetable one by one in the order they appear in the recipe, and a pinch of salt, allowing the ones before it to heat and sweat. After all the vegetables have been added, continue to sauté until until done. Add the fresh herbs, stir, and deglaze with the wine (optional) or use stock or water. Add the remaining sea salt and the stock. Bring to a boil, reduce to a simmer, cover and simmer (low heat) for a half hour (30 minutes). If you're interested you can find the recipe online here. It does look delicious and a good day for soup. We had heavy rain and winds and still going, going to be a mess to clean up tomorrow.